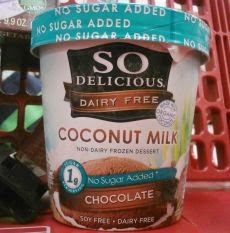 Target gets a handful of So Delicious Dairy Free ice creams in the freezer section. My favorite is the coconut based no sugar added vanilla and chocolate. That way I can come home and not feel so bad dumping stuff like chocolate sauce, potato chips and chocolate pieces on a scoop! Do not like the no added sugar label foo you, this ice cream is perfectly sweet. Creamy, rich sweetness and the right ice cream texture you can eat it as is or like I said add your favorite mix ins and toppings. So Delicious usually runs at $6 a pop at the store, Target clocks in at $4.99 and makes me feel less budget guilty when I want to indulge. Hmmm, I would honestly never have considered buying No Sugar ice cream! Is it sweet because it has diet style sweeteners or just because of naturally occurring sugars? I'm intrigued! it has monk fruit and erythritol - both 'natural' sweeteners. it does not have a funky taste at all.